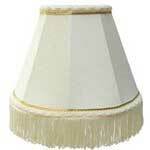 Stylish fabric lampshades in Traditional & Modern styles from Imperial Lighting. Our family run business have been manufacturing the finest fabric lampshades for the past 5 decades, from our workshop in Devon, shipping fabric lampshades across the UK and beyond. 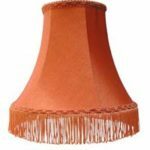 We supply fabric lamp shades in modern & traditional styles from our own ranges or custom made to our customers exact requirements. We have dedicated teams looking after both our residential and commercial customers please contact us any time to discuss your fabric lamp shade enquiry in more detail. Free fabric samples & UK mainland shipping. 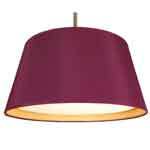 Our fabric lamp shades come with a quality guarantee. 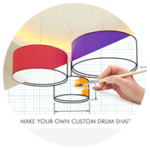 If you are feeling creative why not try our online fabric lamp shade builder? Start by selecting either modern a or traditional style, from there choose the shape and size. The next option is selecting the outer fabric, with over 300 stocked fabrics we are sure you will be spoilt for choice ! 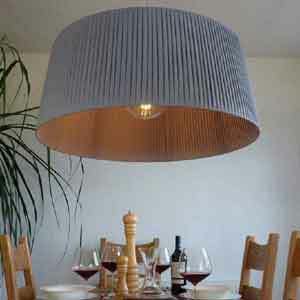 That's it . . leave the rest to us and your stylish fabric lampshade will be handmade and delivered within 3 weeks. Free fabric samples available on request. We manufacture and supply fabric table lamp shades to almost any size shape and of course in any fabric from our own fabric swatch or in your own fabric. 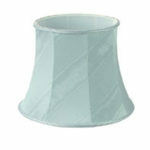 Popular fabric table lamp shapes include drums, empire, coolie, square and rectangles. 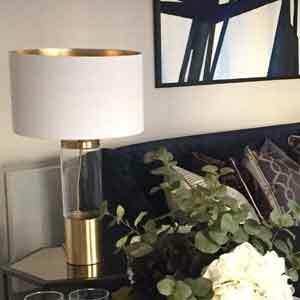 If your fabric lampshade needs replacing and you cannot find what you are looking for, we can custom make a fabric shade for you or even recover your existing fabric lampshade, more details of our lampshade recovering service can be found here. 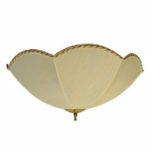 Fabric ceiling lamp shades are probably one of the most popular style of fabric shades we supply. 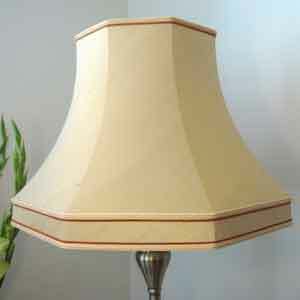 As with all of our fabric lamp shades these can be hand made to any specification you may require. Fabric ceiling lamp shades can be used in any room of the home, the traditional fabric lined lamp shades also help to soften the light creating a warm cosy ambience. Request your free fabric samples here. Fabric candle shades come in all sorts of styles and sizes, typically fabric lamp shades clip directly on to the light bulb but can also fit to the actual light fitting. We can supply fabric candle lampshades to suit most styles of fitting, this includes fabric candle shades with candle clip, normal bulb clip and gimbles for both ES and BC lamp holders. Our candle shades are can be made in any of our house fabrics which include cost effective cotton through to the finest silk dupion, we also offer mushroom pleated fabric and well as pinch pleat and ribbon wrap fabric lampshades. 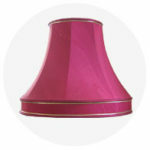 If you have an existing fabric lamp shade that you wish to keep but would like to change the fabric and colour then why not contact us about our fabric lampshade recover service. We can recover your shade in one of our fabrics, or if you have your own material we can also recover in that as well. 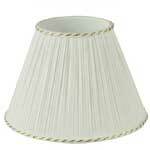 Please note that we only able to recover “Soft Shades” so your lampshade structure must be rigid. It must also have metal struts holding the top and bottom rings together and be in a reasonable condition in order for us to work with the frame. 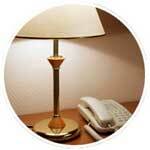 Please click HERE to visit our lampshade recover page. 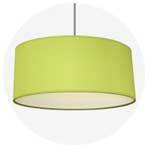 In the world of fabric lampshades there tends to be two main categories that they fall under. 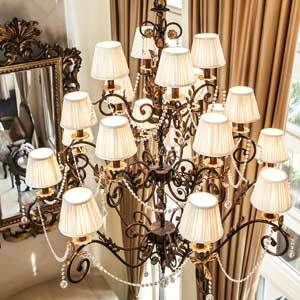 Traditional or soft shades as they are commonly known are lampshades with a rigid wire frame that fabric is stretched over, hand stretching the fabric was own the first fabric lampshades were made and still is today. 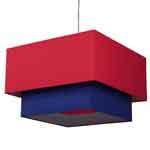 Modern or hard shades see's the fabric laminated to a stiff backing in most cases PVC or card. Once laminated the fabric is rigid enough that it can be formed to a top and bottom shade ring and self support its shape. As the fabric doesnt rest on a frame the shape looks a lot smoother and when lit you do not see shadows through the fabric from the lampshade frame so looking more modern in style. 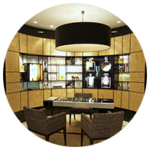 Dealing direct with the trade as well as the public we have supplied modern and traditional fabric lamp shades to hotels, restaurants, offices, cruise ships and a lot more. 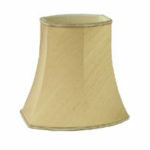 All of our fabric lamp shades are individually handmade to the highest standard in a wide variety of lamp shade fabrics. 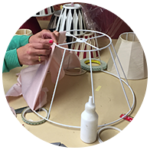 With no minimum order we are geared to making one off fabric lampshades right the way through to larger fabric lampshade projects such as hotel and cruise ship re-fits and are experienced in supplying fabric lampshades within budget and to tight time scales. Our fabric lampshades can also be seen on the big screen, we have recently supplied fabric lampshades to Mary Poppins 2, Mission Impossible 6, The Hustle as well as popular TV series such as Call the Mid Wife, Strictly Come Dancing and Black Mirror to name just a few.